With their first album in about ten years, Matchbox Twenty proves themselves arduous occupants of the middle. Theirs is a legacy filled with mediocrity, one built on erecting pleasant pop-rock tunes for summer events under patio lanterns. There is nothing at all wrong with North. Many obnoxious rock entries have passed this desk and through these headphones, afflicting these ears with some of the most shockingly rotten and unbearably trite sounds to ever reach the fading light of day. This album does not fall in that distended class, but it’s not particularly interesting either. Rob Thomas, Paul Doucette, Kyle Cook, and Brian Yale lived together last summer and hammered out the details of the new record. It shows through the spirited melodies, the stadium rock attempts and even the dance dabbling – everything seems to have a layer of fun and brazen glee. North is an anodyne pop-rock album made by a group of nice boys in nice sweaters and jeans. There’s no danger and no risk; even the edgier moments are coated in something that smells an awful lot like a smile. Take “She’s So Mean,” a track that soaks in its unfashionable pop-rock elation. It’s hard not to smile when Thomas, over excitable guitar, opens with “I n-n-n-know a girl” and rolls right into the amusing bridge. It feels like an outdoor rock song, something that would go well at a summer fair with a little deep-fried something or other and a big stuffed koala. So for what Matchbox Twenty sets out to accomplish, as dry and pedestrian as it is, they succeed largely on the strength of economical songs and self-effacing musicianship. Each song launches in predictable directions and even the dance-pop expedition (“Put Your Hands Up”) has a perimeter of Third Eye Blind safeness to it. The Doucette-written “English Town” is probably the most determined track on North and it does show signs of intellectual life, even if it is a bit affected. The use of atmosphere, effects, strings, and a swelling melody makes for a halfway absorbing listen. 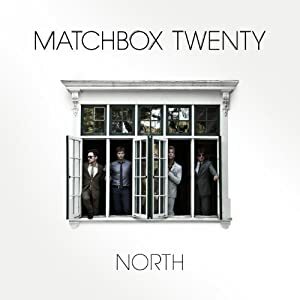 North won’t do anything to move Matchbox Twenty out of the musical middle they’ve occupied since Yourself or Someone Like You, but perhaps that’s part of the plan. Perhaps Thomas and Co. are comfortable playing the unassuming, unambitious pop-rock fellas. Perhaps there’s solace, albeit the soft kind, in creating perfectly decent, perfectly practical art.